The first time Guy Davis ever moved a house, things did not go as planned. He was told it would be a standard move, perfect for a newbie like him to learn the ropes. So on a warm day in 1980, he woke up, cool and collected, and recounted his plan to himself with ease: Put steel under the house, jack it up, get it on wheels, and then drive it down the road. Everything went as planned until Main Street when Guy, and the house, attempted to turn the corner (Main Street is definitely is not the correct street name, Guy said he’s blocked out the real name out due to the trauma of the incident). There he saw a row of parked cars at least six cars long each on either side of the street. All at once, he realized his mistake: he had not taken cars into account in his measurements. The cars, in perfect pecking order, stared back at him mockingly. They blocked any chance of the house moving further. He was stuck. Panic set in. Guy Davis, now a fourth-generation house mover, was attempting and failing to manage his first ever move on a residential home in Islip, Long Island. Then he noticed a church. It was Sunday, mass time. Without thinking much, he ran full speed towards the two wooden doors. “I burst through the doors, I’m drenched in sweat, and they’re just in the middle of giving a sermon about John or something. They must have thought I was having some crisis with God, but I just screamed to get them to move their cars.” And they did: Churchgoers streamed from the building, started their engines, and quickly drove away. Guy, sweaty and wide eyed, was able to finish the move as planned. Guy’s dad, Curtis, Jr., then-owner of Davis Building Movers, the company responsible for the job-gone-temporarily-wrong, was anticipating passing his business onto his son. “I went home and told my dad what had happened, and he just laughed and laughed.” Guy was only 17. Eleven years later, Guy Davis would fulfill his father’s prophecy and inherit the family business. 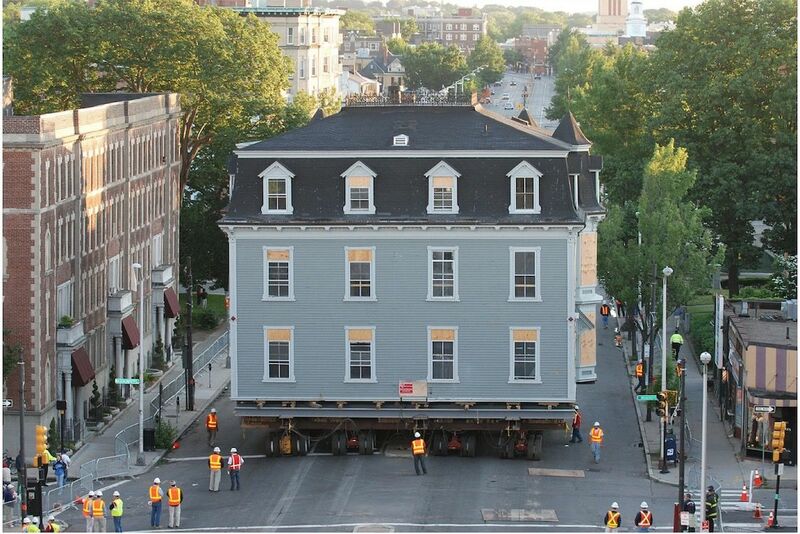 In September of 2018, Brown University contracted Davis Building Movers to move the University’s Sharpe House, a history department building located on Angell Street. The house—pale yellow, 146 years old, 446 tons of brick and wood—was inconveniently located in the plot of land slated to become the University’s new performing arts center. This move is a byproduct of the University’s 2013 strategic plan, “Building on Distinction,” that outlined its commitments for the next ten years, with “campus development” stated as one of four main pillars. This plan promoted major projects like student body increases and the redevelopment of the Jewelry District. For the University, development means enhancing building resources and campus image, increasing Brown’s prestige and therefore profit in the long run. Now six years later, we are seeing the effects of this strategy. Sharpe is part of what Brown University planners have dubbed the “mid-campus zone,” a region that spans from the Ruth J. Simmons quad all the way to the historic Pembroke campus and is currently undergoing substantial change. Within this one zone, four separate projects are currently happening—the moving of Sharpe House and the construction of the new performing arts center, the Nelson Center for Entrepreneurship, and 164 Angell Street, an administrative building that houses the Brown bookstore. One of these projects, the new performing arts center, was initially slated to be built on a plot of land that would require the demolition of four historic buildings. This plan was met with resistance from preservationists and students alike. In a last second change, the University revealed a new proposal that would save the four buildings and allow the performing arts project to be built as planned, only one block to the South. Brown University planners now refer to the Sharpe move as an “enabling project.” This decision, however, was not just an altruistic response to the resistance. It was also motivated by Brown’s preservationist approach to building: Aiming for a “traditional look” on its campus, Brown hopes to keep as many old buildings intact as possible. Sharpe’s move, unlike most other house moves, was an aesthetic and economically strategic choice, not one necessitated by environmental or structural problems. In contrast, the most common reasons for moving a house are involuntary. These include (in order of prevalence) flooding, residents wanting a new basement, and, most pressingly, soil erosion. It took six months of planning to figure out the logistics. To ensure that the house did not undergo massive damage, engineers, contractors, and architects alike planned everything, down to Sharpe’s 90-degree turn; estimated the weight of the six chimneys; and added wood-bracing to all of the stairwells. Then came the raising. Contractors put holes in the foundation to insert steel and wood beams known as cribbing. This holds up the house while hydraulic pumps are attached to start the jacking. Sharpe weighs 446 tons, extremely heavy on the house spectrum, which means each of these steps was that much riskier. In an interview, contractor James Sisson told me it was like a “high-stakes game of Jenga.” When Sharpe was up in the air, 12 separate remote-cotrolled dollies (controlled from Guy’s joystick) were carefully slid under the house. Following this, Sharpe was ready to roll the planned 200 feet (to the west) and embrace its new location on Brown Street. Meanwhile, Brown University administrators and all others involved in the move were invited to a watch party. On December 17, 2018, onlookers watched the house move at a rapid speed of six inches per second from the nearby Granoff Building and celebrated its successful placement with small talk and cake, an exact gingerbread replica of Sharpe House. As it disappeared bite by bite, the real house stayed perfectly intact. Every single house that undergoes a move will invariably sustain some damage, usually in the form of cracks in the building’s walls. These damages are corrected in post-move renovations. While cracks are inevitable, the most risky and tricky part of house moving is disconnecting and moving all the utility lines. The price of house-moving is roughly standardized based on size and distance of the move, but rerouting utilities vary widely and can become highly, even prohibitively, expensive. To put it in perspective, Guy explains that any house can be moved, but many (most) aren’t, because of the utility cost, whether that be standard rerouting or being forced to cut down tons of above-ground wires for an extra-tall house. House moving is a preservationist enterprise. Preservation, conserving buildings from demolition through laws and zoning, has historically been used as an exclusionary tool. Those in power have used landmark designations to block new development that could threaten the “character of a neighborhood,” meaning discrimination along both racial and economic lines. This history, however, is currently being challenged. In Why Preservation Matters, architectural historian Max Page explains that a new era of preservation is upon us—what he calls progressive preservation. This movement sees conservation as the “means to a more economically vibrant and sustainable future”—one that values community and confronts its discriminatory past. I am no stranger to building talk. My parents, a contractor and architect duo, spent dinners bickering over what type of windows should be used in their current project and enjoyed “full-scale modeling,” or designing and re-designing our home, a floor of a retired burlap bag factory. As a child, annoyed by their endless talk of building plans and destruction rather than Dragon Tales and Playmobil, I shrouded the concept of house moving in mysticism, making it the golden unicorn of construction. What if all people, even ones who don’t have homes now, could keep a beloved home? I became curious: what if, instead of erecting all these new buildings, we just kept them all and moved them around like Monopoly pieces? As a child, I couldn’t understand the political implications of the questions of who has homes, who gets to keep them, and who gets to pick them up and move them. In reality, it is the golden unicorn only for places like Brown. For most, saving their homes is an unaffordable process. But like Max Page, I began to envision my own progressive preservation. I lived in a nostalgic dreamland—one full of toylike houses and magical contractors. On January 26, 2019, I see Sharpe House, in its new location, floating in midair. Supported only by steel beams and wood, the building is a full six feet above its foundation. I am inspired to learn more. I email Guy Davis and he responds with a time to meet in-person. We plan to meet on February 28, 5:30 pm on a Thursday, for an early dinner at Waterman Grill. The dinner is his decision. With a busy schedule, he wanted to combine two obligations, me and eating, into one. I suspect the scene, two people, one aged 55, the other 22—seeminglya father and daughter out to a nice dinner over steak and halibut—will look strange from the outside. Then I think about adding in strange cordialities, heady questions about the theory of construction, and over twelve pages of notes, and it becomes all too comical to overthink. After arriving, being seated at a cramped high-top table, and exchanging enthusiastic small talk, I begin questioning him. I’ll start at the beginning. James Isaac Davis, Guy’s great-great grandfather started moving houses on Long Island in the 1890s. He and his team would raise a house, strap it to a batch of horses and pull it down the road. It took so long that sometimes they would have to park the house in the middle of the road overnight and start again the next morning. James himself was so famous for his skills that his obituary was published on the front page of the New York Times. Davis Building Movers, house moving company extraordinaire, was formally incorporated around 35 years later (in 1924), and the rest was history—a total takeover of the house moving field. After two more generations and various technological advances, this booming family business became Guy’s. Four generations of businessmen and four generations of picking houses right up and walking them down the street—or moving them on the same plot of land, or turning them clockwise or otherwise, or raising them into the air, or barging them onto an island for resale. Guy goes on to explain his approach to house moving, casually throwing in grand and fascinating statements like, “Contracting is all about creativity! You must know that firsthand from your dad!” (During the small talk, I had thrown in my father’s profession, but I feel like a fraud, because I can barely tell a flathead from a Phillips.) He rattles off his list of achievements casually: “So there were those three houses at Harvard I moved in 2007, that was interesting because we had to cut down a bunch of street lights and wires in Cambridge… Paul Simon’s house in Montauk, I moved that back from the bluff it was six feet away from just going whoosh right into the ocean forever… Michael Bloomberg’s house, over 600 tons… Jimmy Buffett, oh yeah, after I moved his main house, he had a sun house he wanted to demolish, so I just picked it up and moved it to my own property. We still use it, great light.” Soon it’s revealed that every house that Guy has ever lived in has been moved. I ask him to describe his current property: “Oh, well, I have a lot of sheds. Four to be exact. A lot of times when you’re moving someone’s house they want to get rid of a shed and so they’ll throw it in for free. Sometimes I’ll pay like a dollar. Now they’re mine!” he laughs. I’ve saved my best question for last, but Guy is unphased by what I thought was a clever riddle: If a family lives in a home and they decide to move it somewhere entirely new, did the family really move? “Definitely, they moved. It’s a new home. There’s a whole new foundation. It’s in a new place.” I’m let down by his matter-of-fact answer, so I attempt to ask again, clouding my next question in more nostalgia and hoping to unearth some grey zone in his thinking. “But what about the familiarity of a lifelong bedroom?” Again, he seems unfazed. I realize my childhood notion of preservation is peeking out again. For Guy, house moving isn’t a nostalgic act, it’s his daily life. For me, I wish to live in a fantastical world of progressive preservation, where everyone gets to have a beloved home and keep it. The meal is ending, they’ve cleared out plates, but he asks if I’d like desert. We look over menus, and I see an ice cream sundae that screams to me, honey ice cream and chocolate sauce. When it arrives, I realize all at once that I’ve mistakenly added to the father-daughter vibe. After gorging myself, I thank him profusely, say goodbye, and leave. Walking home, I feel like I’ve doused myself in romanticism. I realize I arrived and left the dinner in much the same place, reveling in my own concocted mysticism. What has changed is the newfound stories that strengthen all the mystery. Guy has offered me a treasure trove, an archive of his memories, to allow my house moving nostalgia to continue unabated. A week later, I plan an interview with James Sisson, Brown University’s Senior Construction Manager, that then leads to an invitation to visit the job site. I’m ecstatic. I hope my house moving knowledge will become less based in fantastical stories, but in real material resources (think wood, plaster, steel). In a few days, I meet James outside the Granoff Center and he gives me my own costume to look the part, a high visibility jacket in bright orange, a hard hat and safety protection glasses. We tromp on over to the job site and he comments, jokingly, on how “next time I come I should probably wear better shoes.” In my loafers, I walk below Sharpe House in midair, supported by only steel beams and wood slats (that really do look like Jenga pieces). It’s apparent that our shoewear isn’t our only difference. I’m interested in Sharpe House for my own mythological reasons, but he is for practical ones. This is James’ fourth house move and 25th year at Brown and as we wander below the house, he explains, “Moving a house is really exciting. There’s always risk, but the challenge makes people coalesce around a single goal. We all are bonded in the moving.” I realize my assumptions were wrong. He, too, has romanticized the process, but for an entirely different reason. When he brings me inside Sharpe House, I see cracks in the walls and some forgotten history department posters. After an extensive tour, I realize I’m 40 minutes late to class. I resolve that I’ll be back to learn more and dash out. Over the next few weeks he texts me photo updates of the construction and says I’m welcome back anytime (if I remember to wear my hard hat and proper shoes). I’m giddy from my findings and my new friends, but can’t help but think about how my wonder seems unchecked. I am running back to class, dressed up in high vis orange and loafers, hypothesizing a futuristic world where there exists no demolition. Meanwhile, on the Sharpe construction site (and similar projects), discussion surrounds things more real and tangible, like steel, wood, and physical labor. “You know that famous building that’s shaped like a duck on Long Island?” Guy asks. “Yes I do!” I respond, shocked that I actually did. I had studied it three years ago as a freshman in Contemporary Architecture, the class I foolishly took, hoping I would gain more from my parent’s dinner discussions. I vaguely remember it had something to with Robert Venturi and how a building can be a symbol. “Well, we moved that building twice. The second time, in 2007, I let my daughters drive it. They were eight and ten, and now for the rest of their lives when they drive past it, they’ll get to say, ‘I moved that house.’” Guy continues to explain his dream of passing on the business to his daughters. “I hope the duck move passed on some of the wonder.” The image of the duck house walking down the street too perfectly mirrors my childhood dreamworld, but I stay silent and imagine myself as that eight year old, steering a duck-shaped building down a winding Long Island road. EVE GRASSFIELD B ‘19 is still bitter that her parents refused to talk Playmobil.